The innkeeper, Liz Miller, has a dog of her own (a handsome Pomeranian-American Eskimo mix), and can be coaxed into allowing a small, well-behaved dog on board. She likes to have the option of saying “no,” though, so she’s not quite willing to call the Inn “dog-friendly.” (Please note that I found the Inn in a database of dog-friendly B&B’s, and remember to confirm that a source’s data is current when you make your travel plans.) Tell her about your traveling companion, and cross your fingers. Chloe was gloriously happy at the Inn, in part because a long, wide park runs along the river where the Inn is docked, and in part because the river had recently covered the parkland and the new smells drove her wild. Also, there were geese and ducks as well as squirrels…. The boat has four suites, two with queen-sized beds (the Pilot House Suite and the Master’s Quarters). We stayed in the Pilot House Suite, because we loved the idea of a wheel house sitting room. The Pilot House bedroom is cozy — we regretted our large suitcases, but there was just room to put up Chloe’s crate and maneuver around it to the stairs up to the wheel house. If you have large suitcases, interpret “cozy” as “cramped,” or prefer not to pit yourself against narrow, winding staircases, you’ll be happier on the ground floor, in the Mate’s Quarters. Our bathroom was small but perfectly clean and sufficient. The shower (no tub) was just tall enough for my very tall husband and had superb water pressure. The saloon holds a couch and fireplace, a pot of coffee and the breakfast tables. It’s a lovely, calm place to watch the river roll by and play cards, chat, or write blog posts (the free wi-fi worked well in the saloon, but not in our room). Our breakfasts were good, and the boat is located only a bridge away from the restaurants of downtown St. Paul. We will happily return, assuming that Chloe remains a welcome guest — our other dog-friendly options in St. Paul were large chain hotels, and how could they possibly compete?! I didn’t know that there were any dog-friendly boats. I know she has the option of turning down guests. Sounds like a great trip. It was a great trip! 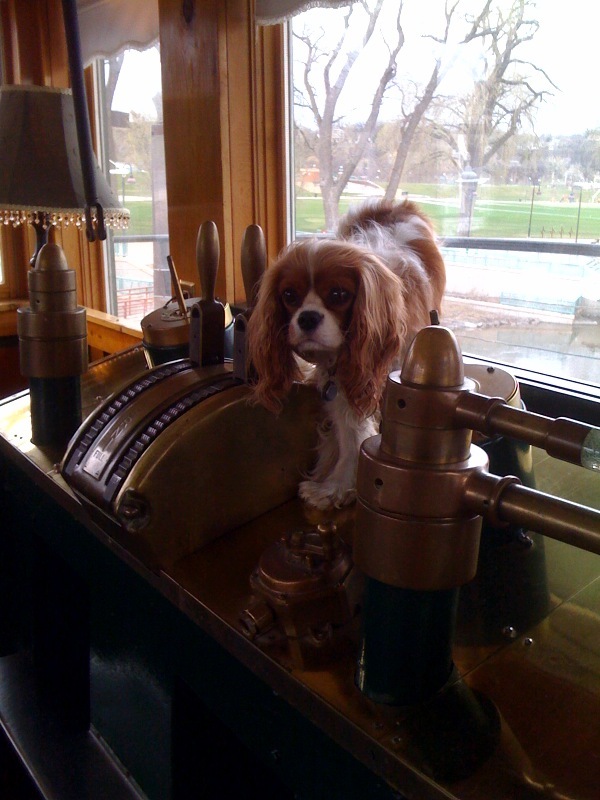 Now keep in mind that the boat doesn’t move around the river, so it doesn’t count as a dog-friendly cruise — but it was an unusual and fun hotel. Great that you could stay with Chloe on board – those are the experiences you don’t forget. I am imagining the owner would say “no” to 110 lbs of Ty and Buster?! Hello, Rod! I suspect she’d say — and with good reason — that they wouldn’t fit in the rooms!